First to apologize. 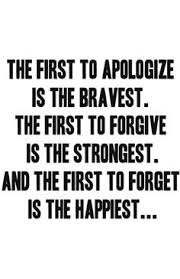 First to forgive. First to forget. As a kid, I really wish I had known how to fight for being first in line for these privileges. The whole apology thing could have saved me years of guilt and shame. Instead, I crafted an elaborate cover-up to hide my embarrassment over her embarrassment. She never spoke to me again and I didn’t forgive myself for over a decade. Maybe learning to be first in line for these three skills should have been the first thing we learned in the first grade.